One of craft beer’s biggest trends of recent years is the explosion of barrel-aged beers hitting the shelves and taps. These complex and often potent brews require extra care and time to produce, and it seems that craft brewers enjoy making them as much as beer lovers enjoy drinking them. Barrel aging is a way for brewers and cellarmen to add extra complexity and layers of flavor to beer, and everything from raw oak barrels to used spirit barrels to retired red wine barrels can be used by brewers looking to produce creative concoctions. Many different styles of beer make good candidates for barrel aging, but malt-forward and high alcohol styles like imperial stouts and barleywines most commonly see the inside of a barrel. Using wood barrels for beer is of course nothing new, but until the craft beer revolution, nearly all the barrels used in brewing were coated on the inside with brewer’s pitch to prevent the barrel from influencing the beer. The sour ales of Belgium are the main exception — they require microorganisms in the wood to provide the tart and funky flavors so prized by fans of lambics. American craft breweries also use wood-aging for their “wild ales”; the Russian River Brewery in Santa Rosa is one of the most well-regarded sour beer producers in the state. Their line of complex barrel-aged beers use a range of barrels from Sonoma County wineries that once held chardonnay, pinot noir, or cabernet sauvignon. 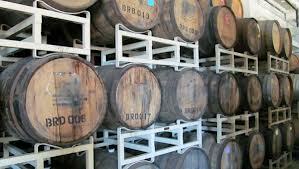 Used spirit barrels are more commonly used in American craft beer, and aging potent imperial stouts in bourbon barrels is the most popular combination. As a beer ages in a barrel it will pick up flavors from the wood, as well as notes from the spirit that the barrel previously held. The resulting melange of toasted oak, vanilla, and boozy bourbon flavor matches the roasty chocolate and coffee flavors of imperial stouts, and there are many examples of this fusion of beer and wood.